File recovery software is one of first aid tools to undelete files and to recover deleted files accidentally from computer disks and Recycle Bin of your PCs. Recently one of my relatives asked me "How to recover my files deleted even from Recycle Bin?". The answer is easy with professional and free file recovery software like UndeletePlus, Recuva or FreeUndelete tools. Although there are plenty of free file recovery software, in this guide I want to focus only these three undelete files software. First of all I want to talk about UndeletePlus file recovery tool which is free to run and see if your deleted files can be saved back. But when you decide to undelete files before they are overwritten and totally damaged, you have to pay licence price to use Undelete Plus software. 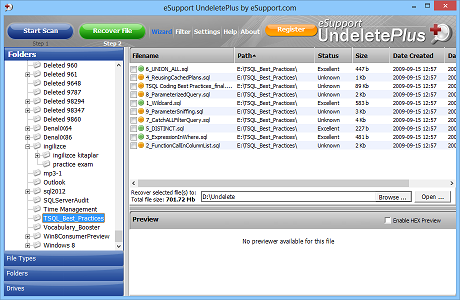 Although it is not free, UndeletePlus is one of best file recovery software I've ever tested and used. UndeletePlus has the best results when I scan my computers hard disk and external disks for deleted file recovery. This undelete software is successfull to list more files than others. So you have more chance to recover files that have been long ago deleted and overwritten only a few times. As other softwares like Recuva and FreeUndelete file recovery tools, the application lists the file status as excellent, good, poor, overwritten, etc. This undelete software also provides preview of the file especially for image files and photos if it is possible. Again you can see contents of text files if they are in good status. All file recovery program will find deleted files as many as they can, but if you can not find deleted file that you really care for among found files list all this effort is meaningless. An important feature of UndeletePlus software is to view found deleted files list in different formats and in different grouping categories. For example, you can see the list of deleted files according to their file types like archives, documents, movies and videos, music and audio, photos and images and the rest as uncategorized files. But it is also possible to view deleted files in folder structure too. Folder structure provides a folder structure and files deleted when they are in that folder. So instead of scanning all files, you all need to find the folder in folder structure and restore it back using this view. To retrieve deleted files from your computer's hard disk, SD cards, flash or USB disks, or other external disks starts with scanning drives for deleted files. For more successfull file recovery process, you should avoid running your PC for unnecessary situations. Try to avoid writing on your disk, saving files or downloading. Writing to disk might possibly overwrite on some of the deleted files and make it impossible to undelete them later. If file recovery software is not already installed on your computer, try to install it on a USB disk if possible. Or try to install it on a disk other than where the files are deleted from. Launch undelete software and choose your target drive. Start scanning drives to find deleted files and form a report before undelete task. This disk scan will take a considerable time proportional to the disk size. So be patient and let the tool do its job before interrupting it. If you are not satisfied with the list of files that are shown to you, or could not find the deleted files in the list, you can run file recovery software in deep scan mode. As the name deep scan implies, this will take a longer time. But I think it will worth it if deleted files recovery is more important when compared with time spent for undelete those files. After the undelete tool displays you the deleted files list, mark the files you want to recover. You can mark more than one file, and do not forget most file recovery tools will require a re-scan of the disk before a second file recovery task. So choose as many files as you can before you start file recovery on your disk. It will be best to choose the destination folder for undeleted files on a different disk drive. This will prevent over-write on previously deleted files. I hope you are happy after saving your files back and keeping your important documents or precious photos from totally loosing. Do not forget, it is a best practice to keep a back up of your important data or important files. It is better to save them on a safe place rather than trying to recover files after an accidental deletion.